How might we start a chain reaction of happiness in the community? This summer, a group of students dove into the topic “finding happiness.” The group began their research by watching the documentary “Happy” and interviewing experts in the community including Terese George, a mindfulness coach, and Karen Lowe from Simpatico about emotional intelligence. The group traveled to various places around Boise including malls, parks, and daycares, interviewing anyone they could about what it means to be truly happy. After identifying themes that lead to happiness including being grateful, a strong connection with nature and recognizing one’s own emotions, the team concluded that relationships often play the most important role in being happy. They asked people in the community to nominate someone they know who inspires happiness to receive a celebration for their hard work and dedication to improving the lives of others. After sifting through nominations, the group crowned Mr. Jon Swarthout, founder of TRICA, as the “King of Happiness.” After a performance by his dance students at the Saturday Farmer’s Market, the students dressed in fun costumes and paraded Mr. Jon and his daughters through downtown in a decorated rickshaw that would be donated to TRICA as a means to spread even more joy. The parade ended at the TRICA building where Mr. Jon gave a tour and spoke about his mission to bring happiness to children and their families through the arts. 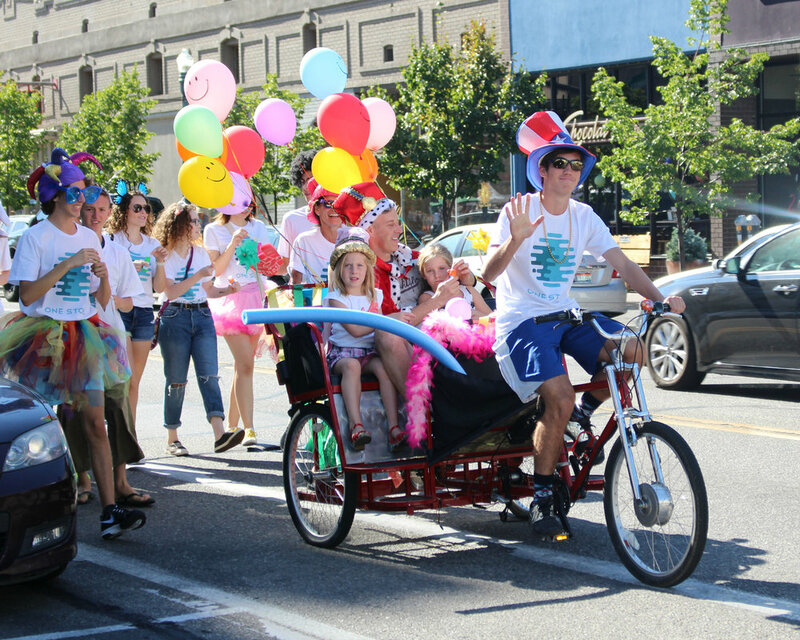 15 students, 14 dancers and at least 50 people from the general community were present to witness the award and parade from downtown Boise to TRICA. "Thank you for doing this! Mr. Jon really deserves this." "The best part was that it not only impacted Mr. Jon, but everyone that was watching." "Recognizing how somebody else makes people happy helped me reflect on what makes me happy. This inspired me to work towards my dreams, because anything is possible with determination."